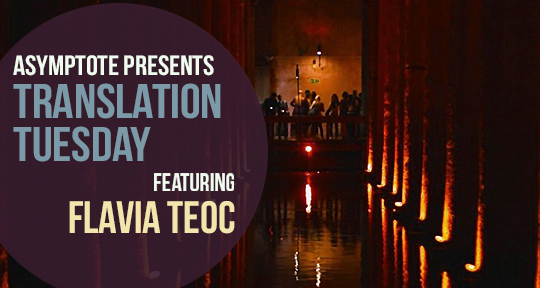 We are thrilled to feature Flavia Teoc’s poetry for the first time on Translation Tuesday. Teoc’s lines visit Yerebatan—the magical site in Istanbul where the Basilica Cistern hides a special sighting of Medusa. Under the dim lights of Yerebatan, Teoc’s fragrant lines shine brighter. Are the grapes slowly growing sour on a vendor stall in Yerebatan. Shadow one late afternoon, and a stray dog’s quick nap nearby. For those perfect in all their ways will never touch them. Flavia Teoc is a Philosophy-graduate poet, essayist, and journalist, who has published several anthologies of verse and prose. She has been published in many journals in Romania, such as Atheneum, Steaua, Poesis, Transylvanian Review, and Observator cultural. She is the author of several volumes of poetry: Înzeire (Albatros, 1997), Din casa lui Faust (Clusium, 1998), Braţul pierdut (with a foreword by Ştefan Borbely) (Albatros, 2001); and fiction, Kyrie Lex (Cartea Românească, 2009). Her work was translated into English—The Dice (Criterion, Norcross, SUA), and French—De mur en mur (Petits Bonheurs, Nantes), while selections of her work have been published in various literary magazines in Hungary, Italy, and Israel. As a scholar at Aarhus University she recently authored a very well received book on the language of skaldic poetry.